Working on a loading dock can present a wide variety of hazards for workers. Aside from that, it also poses special safety matters. Workers, on the other hand, need to extra careful about what they’re doing. Most importantly they should be aware of other persons around them especially co-workers using forklifts as well as other forms of material handling equipment. In this content, we will discuss the keys to loading dock safety. In addition to that, we have rounded up some functions of beacons so that you’ll have a better understanding what exactly beacons are and if these devices are significant to loading dock safety. – Keep floors in good condition, clean, and dry. Place packaging tools, containers, and other equipment away from driving and walking areas. Furthermore, make to store flammable materials such as oily rags in closed containers to avoid the chance of explosion. Also, spills should be cleaned up immediately. Broken or cracked flooring or concrete should be reported to prevent accidents. To ensure that the load can be properly handled make sure the dock plates load capacity is checked. Moreover, secure the movable dock boards in place, they will not drop and slip at the same time. Before loading and unloading, checking that the trailer or truck’s wheel chocks are properly in place is essential to avoid any accidents. Also, to preclude carbon monoxide exposure, the driver must turn off the engine – both odourless and invisible carbon monoxide can be dangerous. By simply loading and unloading properly you will be able to prevent injuries. However, when you’re doing it make sure to use dollies and forklifts instead of lifting by yourself. Also, don’t try to lift pallets and skids alone. But when you do lift, keep your back straight and bend your knees, as this will allow your legs to do the work, rather than your back. When your co-worker is loading or unloading docks make sure not to distract him and don’t ever ride on forklifts. Also, when you hear the forklift horn sounds, ensure the route is clear. Nonetheless, wear ear protection, a hard hat, and eye protection when needed to protect yourself against flying or falling objects. In order to prevent accidents don’t run or walk on loading docks. Better yet, stay away from the loading dock edges and do not jump off or onto loading docks. However, if you’re the operator or part of the current operation make sure to wear a pair of durable shoes with non-slip soles which supports the ankle and foot. More importantly, be vigilant and watch where you are going. 1. Tripping or slipping on oily, broken, and wet floor surfaces. 2. Injuries from unsafe dock plates. 6. Injuries from careless behaviour around vehicles and forklifts. So, that’s the key points to loading dock safety covered, so let us now move on to the different function of beacons. What Are The Different Functions of Beacons? A beacon is a type of device that is specifically designed to draw attention easily to a particular place. Beacons are not only valuable for navigation purposes, in fact, they are also used for defensive communications. These devices were classically fires which were struck in locations on towering structures or hills that were utilised for either signalling over land, especially when enemies were approaching, or lighthouses for steering at the sea. Nowadays, beacons are being used for various purposes. They are located in a vast number of buildings worldwide to offer security and safety. Moreover, they’re commonly seen in high infrastructures or buildings, vehicles, and power plants. Without a doubt, beacons do provide a variety of benefits, and are the number one choice for warning lights. Beacon Lamps: Are They Significant For Loading Dock Safety? 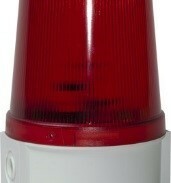 Beacon lamps can be used as safety signalling devices that can help alert truck drivers as well as loading dock operators, regarding the current status of docks or docking docks. Aside from that, they also offer clear instructions to incoming drivers when approaching or loading docks. Beacon lamps can be also utilized as signal lights in different applications such as lift gates, drive-up windows, inspection lanes, and access to secure places. They can also help in providing additional safety to loading docks by enhancing a driver’s awareness when backing to open docks. In addition, they offer an ideal position for truck drivers to align a trailer with commercial building or warehouse doors while reversing to loading trucks safely. Nonetheless, the use of beacons can reduce risks of accidents around and in loading dock areas. With that said, it’s clear that beacons are undeniably significant to loading dock safety.